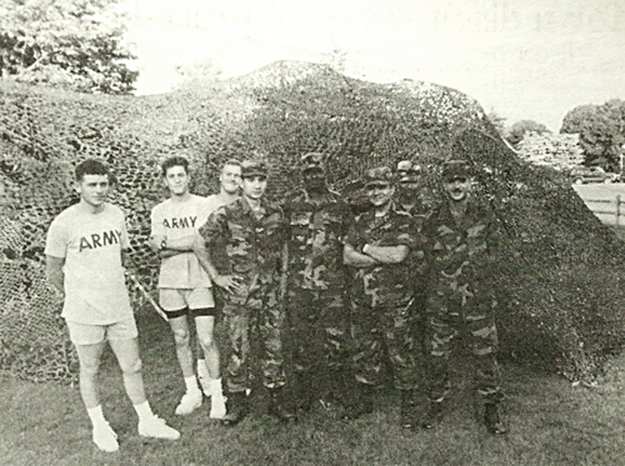 REPORTER FILE PHOTO | Members of Charlie Company, 10th Signal Battalion on Shelter Island in 1993 for Operation Golden Circuit, designed to improve communications throughout Suffolk County in the event of a hurricane or other emergency. Ten years ago, North Ferry was hobbled with serious delays when its MV Mashomack, the company’s largest boat, had to be taken out of service for repairs to its steering mechanism. The fact that one of the company’s 12-vehicle ferries was also out of commission, leaving three small boats made for long delays for drivers. Some reported waiting as long as four hours. The problem was further compounded by the need for Corazzini Asphalt to bring large trucks loaded with asphalt to the Island for paving work. And, wouldn’t you know, it all happened on a Thursday, that day of the week when truck traffic is particularly heavy with many suppliers bringing goods here for the weekend. It took until the following day to get the part for the Mashomack and get it back in business, restoring service to the normal summer levels. POSTSCRIPT: Last Saturday’s Shelter Island 10k demonstrated that North and South ferry companies were well up to the challenge of handling particularly heavy traffic from the North and South forks. Boats were full and heavy, but lines moved relatively fast with no complaints about wait times that may have been a little longer than usual, but very tolerable. When members of Charlie Company, 10th Signal Battalion were spotted on Shelter Island in late June 1993, rumors abounded about what brought them to this community that locals and visitors consider paradise. Was it related to a cargo ship of Chinese refugees recently grounded off Rockaway? Or was it linked to terrorist activity that resulted in the bombing at the North Tower of the World Trade Center the previous February? Try none of the above. In a relatively peaceful period when troops weren’t being deployed around the globe in the numbers they have been in more recent years, it was all part of a training exercise for a hurricane emergency response to test communications between all the towns in Suffolk County. Then Supervisor Hoot Sherman said he had been informed of the dry run, but never expected it to take the form it did with so many soldiers on the Island. He would have informed residents in his weekly Reporter column had he been told the nature of the troop deployment, he said. POSTSCRIPT: Today, there are efforts throughout Suffolk County to improve responses to emergency situations such as hurricanes. But much of the emphasis is on local preparedness, recognizing that it could be several days before outside emergency help could arrive to shore up relief efforts. Police Chief Jim Read leads the effort on Shelter Island, meeting with various emergency responders to assess previous efforts and determine what needs to be done to improve Islanders’ abilities to handle a crisis. Anja Bergman was Shelter Island School’s valedictorian and Donald Card Jr. was salutatorian in June 1983. Ms. Card was headed to the College of William and Mary in Williamsburg, Virginia, on a four-year Army ROTC scholarship while Mr. Card planned to attend Bucknell University in Lewisburg, Pennsylvania, on a four-year Navy ROTC scholarship. POSTSCRIPT: This year’s valedictorian is Katy Binder, who plans to attend Villanova University as a physics major. The salutatorian, Morgan McCarthy, plans to attend Geneseo. Both will address their classmates and those who attend Saturday’s graduation ceremonies. The year was 1963 and five residents out of the 19 eligible turned up to vote in Dering Harbor’s village election that swept William O’Connor back into office. He won all five votes and was elected to another two-year term. POSTSCRIPT: Heather E.G. Brownlie and Richard A. Smith were re-elected on Tuesday to the Village Board. Former supervisor Gerry Siller, a Democrat, in June 2003, announced he wanted his old job back and was ready to stage a campaign against incumbent Republican Supervisor Art Williams. In announcing his candidacy, he told his party members he was accepting the nomination with “mixed emotions” because he thought the town was moving in a “very bad direction.” He said while he loved serving as supervisor, he had also enjoyed the last two years being out of office. Ultimately, voters in November decided they wanted another two years with Mr. Williams who won by a slim margin, 783 to 727. POSTSCRIPT: The Democrats have just announced their slate for the November 2013 election with incumbent Supervisor Jim Dougherty leading a team that includes Town Board candidate Robert Reylek and Highway Superintendent Jay Card Jr. In 1993 a blackout darkened Shelter Island disrupting plans of residents and visitors and spurring calls to then Supervisor Hoot Sherman, the Reporter and, of course, police to find out what happened and when power might be restored. A failure of a submarine cable linking a Southold with Shelter Island caused the problem that started on a Sunday morning about 9 a.m. Radar was used to detect a fault about 300 feet from Shelter Island and the Long Island Lighting Company was able to restore electricity in just under two hours. POSTSCRIPT: Superstorm Sandy last October damaged a cable linking Shelter Island to Southold and a project is under way to install new cables to ensure there will be sufficient power on the Island during the heavy summer season this year. After the Shelter Island School District’s budget was defeated in mid-May 1983, administrators and Board of Education members opted to present the same $1.9 million budget to voters for a second look on June 8. But prior to that vote, they set a “brass tacks” meeting with the public to explain the spending plan and answer questions. Nonetheless, voters on June 8 again turned thumbs down on the budget. POSTSCRIPT: This year voters gave a resounding “yes” to a more than $10 million budget. The year was 1973 and the Passionist Fathers were welcoming Islanders to a party in celebration of the first decade of their work here. During their tenure on Shelter Island, the Passionist’s offered counseling to youths and other residents of all faiths. Money raised from the dinner dance tickets and contributions went to the monastery to help support such work. POSTSCRIPT: St. Gabriel’s has been closed now for several years with the final piece of the property that belongs to the Passionist Fathers up for sale. There has been an ongoing debate about whether Community Preservation Fund money should be allocated to buy the remaining property and preserve it as open space or allow it to be purchased by a private developer. The jury is still out, but Supervisor Jim Dougherty is pushing for public purchase of the site overlooking Coecles Harbor.